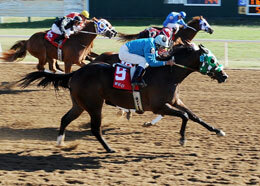 Comal Blue (#9) holds off One Valiant Hero (#1A) in Sunday's Black Gold Futurity-Division III at Will Rogers Downs. CLAREMORE, OK�OCTOBER 6, 2013�Lightly raced Comal Blue became a stakes winner in only his third start Sunday afternoon by defeated One Valiant Hero by a neck in the $95,000 Black Gold Futurity-Division 3 at Will Rogers Downs. Bp Coronas Policy finished half-a-length back in third. Under jockey Randy Wilson Comal Blue went wire-to-wire in :17773 seconds into a 15 mph headwind. The $38,000 winner's purse pushed the winner of two of three starts earnings to $43,982. Tana Pace trains the IVORY JAMES homebred for Steve Kirks. Comal Blue is out of the Stoli are Stoli Oak. One Valiant Hero, who also finished second to Comal Blue in the September 22 trials, earned $16,150 for owner Valerinao Racing Stables, LLC. Eddie D. Willis conditions the colt ridden by jockey Jimmy D. Brooks. T I Cattle Company bred the sorrel colt in Texas. Rodney Reed saddled Bill Price's homebred Bp Corona Policy. Paul Nieto had the riding assignment. The $10,450 third place check almost doubled his earnings to $26,851. Completing the field were Spit Hit The Fan, Runaway E T, Regard Watah, Mr Famous Eagle and Dashin Go Bye. Rocketair and The Ultimate Eagle were both scratched.